As part of the world wide Scout movement Venturers have their own uniform. Scouts wear a dark blue uniform shirt with a maroon highlight on the collar and sleeves together with navy blue pants or shorts and a belt. They also wear the blue and black 1st / 14th Brighton Sea Scouts scarf, a woggle and badges. 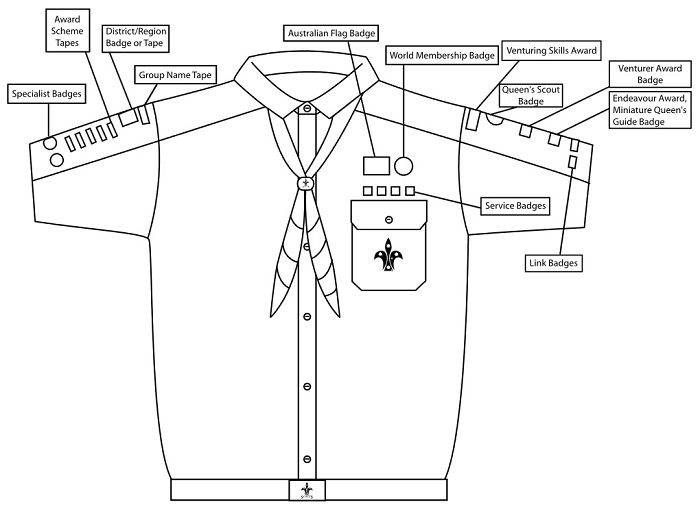 The uniform may be worn before the Scout is "invested" or becomes a member, but the scarf and woggle will only be presented to them at their investiture ceremony and cannot be worn until then. 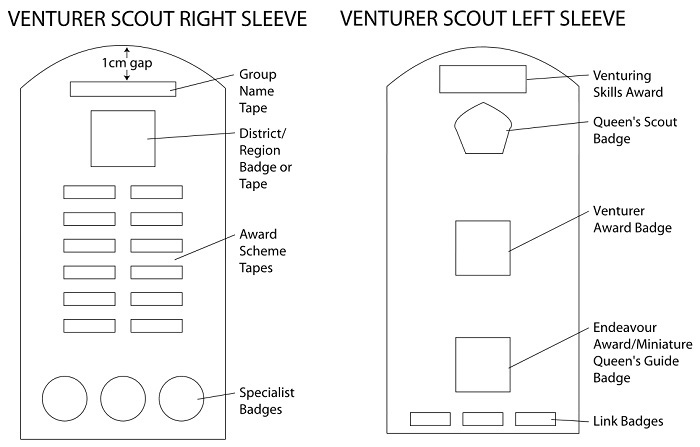 All badges need to be sewn onto the Venturer Scouts shirt in specific locations. The diagram below shows the correct placement. The Venturer Scout Award Scheme is designed to widen Venturers' interests and knowledge, while challenging them at the same time. It assists in planning a balanced program based on the Aims and Methods of Scouting. The Award Scheme is not compulsory for Venturer Scouts, but those who do attempt it find they have a lot of fun while discovering new things. There are four main components to the Award Scheme. These consist of the Venturing Skills Award, the Venturer Award, the Endeavour Award and the Queen’s Scout Award. 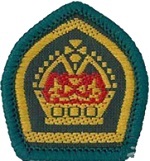 In addition, Venturers may earn a number of special badges depending on their interests. First up the Venturer Scout will need to gain the Venturing Skills Certificate and badge. A sponsor will be appointed (either a Unit Council member or an experienced Venturer Scout) who will help you acquire the basic skills which will allow you to enjoy and participate in the outdoor activities that form part of the Venturer Scout program and also explain the award scheme. 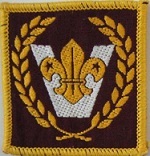 Previous experience in Scouting can be used to obtain credits for the individual components of Venturing Skills, subject to Unit Council approval. The Venturer Award is gained by participation and is a great way for the individual Venturer Scout to achieve an Award based on personal best and challenge through activity areas. There are 13 activity areas, five of which must be completed as well as any other two. This is a step toward achieving the Endeavour and Queen's Scout Awards. The Queen’s Scout Award is highly regarded in the community at large and the Royal Certificate is presented to the Venturer Scout by a representative of the Queen. The requirements are designed to be inspiring and challenging and to take you to a much higher and demanding level. In some States and Territories, your Queen’s Scout Award could be registered on your School Exit Certificate. To achieve the ultimate in Venturing, complete all 13 Venturer Award activity areas and any four at Queen Scout Level (1 per area). The Endeavour Award allows you to pursue an activity area of your choice from the Venturer and Queen’s Scout Awards, and take your knowledge to a higher level of expertise. You need to undertake significant research, effort and application for a period of at least 50 hours beyond the level required for the Queen’s Scout Award. 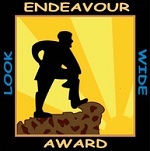 You do not need to have gained the Queen’s Scout Award to attain the Endeavour Award, although you may complete both if you wish. Endeavour Award candidates may also complete a VET course and receive a Statement of Attainment in any Adventurous Activity Area.